I attended the Penang Food Blogger third gathering and was bowled over with a simple, Hakka dish brought by one of the food blogger, Min. It got me thinking of the dish so I decided to do it myself! Hah! Nothing a Hainanese woman cannot achieve. First, I called up my eldest sister-in-law, who is my hubby’s eldest sister. They are Hakka and I thought she sure know how to do it. But she hasn’t even heard of this dish! She told me their grandmother cooks mostly Malaysian flavoured nyonya dishes. So, I Googled and figured out the recipe myself. I steamed the yam and mashed it. Then, I discovered I have ran out of tapioca flour. But have no fear, I got plenty of tang meen fun and corn flour. I substitute the tapioca flour and actually ended up with very nice texture. 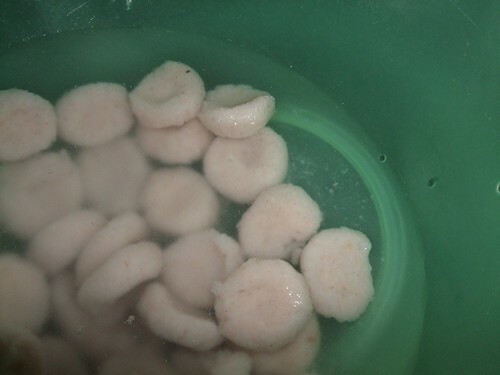 I guess tapioca flour alone would make the yam coins or abacus seeds rather slimy. Using corn flour and tang meen fun makes the yam still rather floury. Steam 300 grams of yams and mash it. 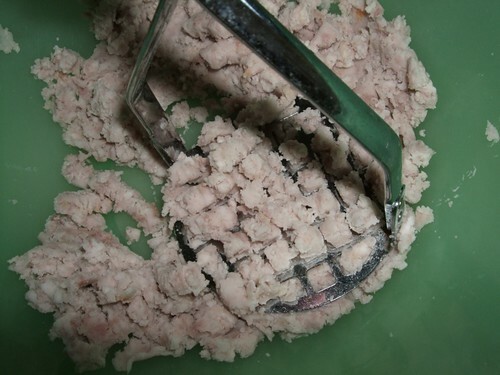 Cutting the yam into tiny pieces will make it cook faster. Half a cup of boiling hot water. Pour the hot water into the flour to partially cook it. Using a wooden mixing spoon, mix the flour and hot water into a ball. When cool enough to use your hands, knead the mashed yam with the ball of flour. I added a pinch of salt, pepper and five spice powder to make the yam coins more flavourful. When you get a nice, smooth ball of dough, roll them into oblong pieces. Just add more flour or water to get a nice ball of dough. It is hard to judge the quantity as some yams are more floury while others are watery. Make long strands of the dough, cut into tiny pieces and use your finger to press a bit. Imagine what a Chinese abacus seeds are like? Just about that size. Boil a big pot of water and throw in the yam coins. Let them boil till they float up. Transfer into a big bowl of tepid water (room temperature water). Based on what I ate at the food bloggers’ gathering, I added these to stir fry. Stalk of Chinese celery and spring onion, cut into inch long. Chinese celery is mandatory to give the flavour. 6. Gently put in the yam coins and gently mix well and heat through. You need to be gentle to avoid the yam disintegrating as I have used more yam than flour to give the Hakka abacus seeds more flavour. My Hakka hubby and Hakka sons loved the dish. So, yay! Hainanese woman won the award for stealing a Hakka recipe and making it so tasty. Next time, I am going to make them in big batches and feed them to my four Hakka sisters-in-laws and trot around proudly because Hainanese women are good cooks. Hehehe. 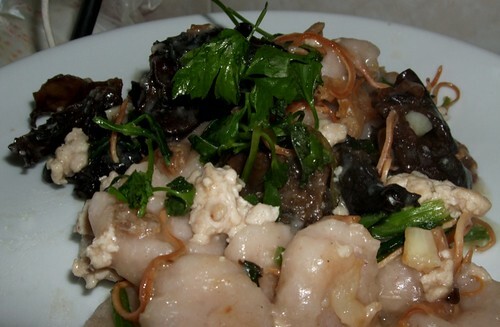 If you are a Hakka, can you share the real Hakka recipe with me? I have been looking around and get various versions so I do not know which to follow. Siew Mai – How do they make the skin moist? Why is Chinese steamboat call ‘ta pi lor’? haha, cool!! i m a hakka and i m so glad u tried some cool hakka dishes out. i think i wanna go bk to kampung when i can find time off…hehe. good on u!!!!! 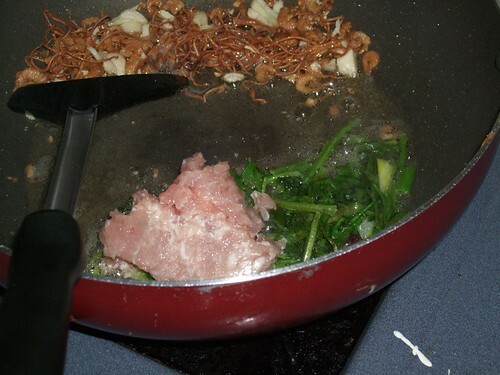 Wow…you are super fast…can cook up this dish just after a few days from the gathering. Looks delicious, hope we get to taste your dish next time around. my pho pho used to make these for me, so nostalgic! 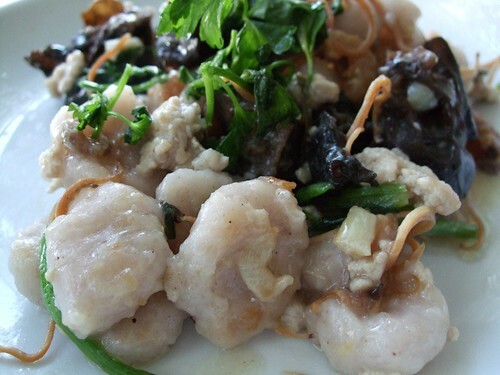 I have eaten this dish many years ago cook by a hakka friend. It is very delicious. I have a recipe of this dish in one of my cookbook collection. Will try to cook it next time. I think you did a great job, figuring out the recipe and then cooking it. Very impressive! And I love the way you document everything. Hi there! A bona fide Hakka recipe for this dish here. I recently learned it from the Hakka matriarch on my Dad’s side of the family, so thought to share with you!